In the world of mobile gaming, there are a handful of genres and themes that prove to be popular. 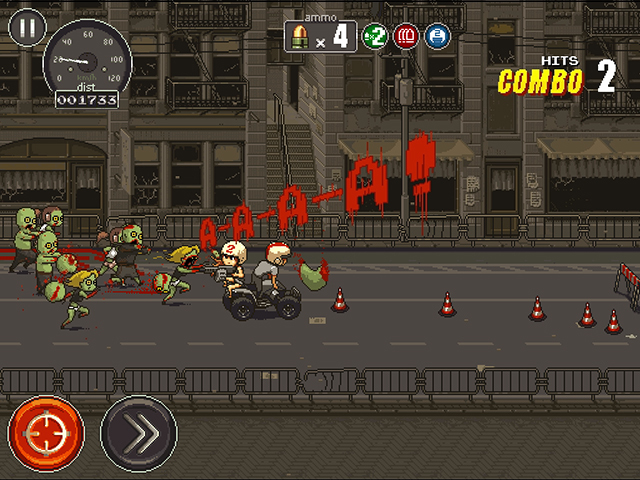 Dead Ahead combines the incredibly popular genre of the endless runner and applies it to the massively popular world of zombies, while also featuring 16-bit style pixel art. What Dead Ahead lacks in originality, it makes up for by being a fun take on a well-worn style of game. Dead Ahead is an endless runner wherein you drive a motorised vehicle away from an army of undead that are constantly chasing you. Meanwhile, you have to keep your eyes on the road as debris, burnt-out cars and other barriers litter the streets, waiting to knock you over your handlebars, head first into the asphalt. There are also plenty of zombies ahead to run over and score some extra points. Using an on-screen button to accelerate, and by touching the upper right or lower right sides of the screen to navigate around obstacles, you are absolutely swarmed by things wanting to kill you. Accelerating too fast might cause you to smash into a wall if your reflexes aren’t sharp enough or your vehicle’s cornering abilities are too slow. Meanwhile, don’t accelerate enough and the horde will catch up with you and scoop out the contents of your cranium. Luckily, you’re also armed with a weapon that you can use to shoot behind you should any zombies get too close. It’s certainly a bit more demanding than the usual endless runner, and while in the beginning it takes a while to get used to obscuring your view of the road ahead with your right thumb as you try and control your bike, the control scheme is simple enough to work well (although it would be nice to be able to swap the placement of the movement controls with the shoot/accelerate buttons). The balance between driving slowly enough to avoid obstacles, but fast enough to escape the zombies is relatively challenging, and that doesn’t even take into account the regular appearance of the “Boss”, a large tank-like chap who takes quite a few bullets to kill and is prone to pouncing on you. Thankfully, you have a number of power-ups that can be picked up to make your escape a little easier. Infinite Ammo and Quad Damage make it easier to take down your aggressors while Nitro causes you to drive at lightspeed, passing through obstacles and skipping a good thousand metres of distance in seconds. If you don’t want to pick up these items, you can always shoot them, causing them to explode and set fire to any nearby zombies. The further you drive and the more zombies you kill, the more and more coins you earn, which can be used in The Garage to purchase new weapons and vehicles, or upgrade your existing modes of transport or purchase temporary perks (increased ammo per clip, an extra life, 1000 metre head-starts, etc.) to make future drives a bit smoother. All of these items are priced fairly, so it always feels feasible to earn the next upgrade. Of course, there are some highly powered items included as in-app purchases, but buying them invalidates the point of playing the game. As with many games of this type, progression is defined by rankings. 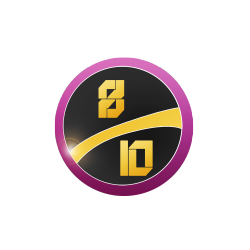 Three objectives must be passed before the next ranking is earned, such as killing a certain number of zombies, reaching a certain combo amount, or even driving a pre-determined distance without accelerating. Again, these are fair but still challenging enough. As you climb the rankings, you unlock more vehicles and weapons for purchase in The Garage, and even some new harder levels (the harder the level, the higher the coin multiplier). It’s these regular unlocks that make Dead Ahead an incredibly rewarding game. 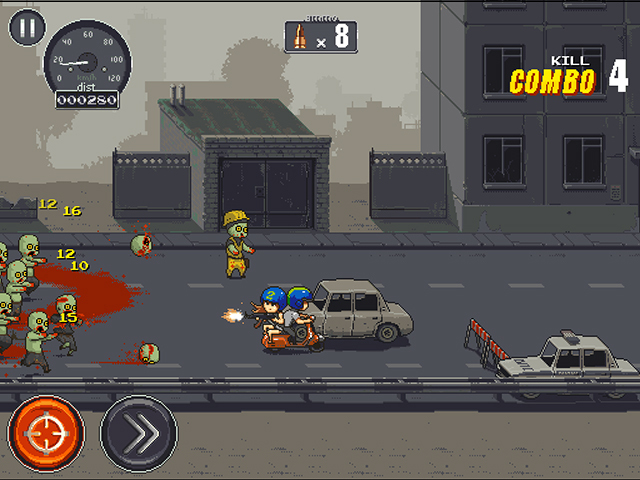 Starting off with a scooter and a tiny revolver, you quickly get the chance to play around with more powerful vehicles such as a dirt bike and side-car bike; plus, you get to wield zombie mainstay weapons such as shotguns and submachine guns. It always spurs you on to play a little bit more to try and earn the next rank or unlock something new. While you can pay for coins through in-app purchases, the game never forces this down your throat, nor requires you to spend a penny (you can pay to remove adverts, but I hardly saw any as it was). It’s clear that the visuals are heavily inspired by the work of animator Paul Robertson (famous for short film Pirate Baby’s Cabana Battle Street Fight 2000, and Scott Pilgrim: The Game), with a very pixellated, 16-bit style look. Everything is well animated, bringing oodles of character to the game, and it looks great on my iPhone 5. The sound is also pretty decent too, with some dark-sounding tunes that fit the game without becoming annoying. Also, there are some tasty splat noises as you run over enemies, as well as a suitable Mortal Kombat/Killer Instinct style voice-over as you achieve higher combos. VERDICT: Dead Ahead may not be the most unique game out there, but it has that “one more go” factor that every great mobile game should have. It’s fair with its challenges and its rewards, and adds a bit of depth to the endless runner template.